The term "amoeba" refers to simple eukaryotic organisms that move in a characteristic crawling fashion. However, a comparison of the genetic content of the various amoebae shows that these organisms are not necessarily closely related. All living organisms can be broadly divided into two groups — prokaryotes and eukaryotes — which are distinguished by the relative complexity of their cells. In contrast to prokaryotic cells, eukaryotic cells are highly organized. Bacteria and Archaea are prokaryotes, while all other living organisms are eukaryotes. Amoebae are eukaryotes whose bodies most often consist of a single cell. The cells of amoebae, like those of other eukaryotes, possess certain characteristic features. Their cytoplasm and cellular contents are enclosed within a cell membrane. Their DNA is packaged into a central cellular compartment called the nucleus. Finally, they contain specialized structures called organelles, which execute a range of cellular functions including energy production and protein transport. Most of these organelles are common to all eukaryotic cells, however there are a few exceptions. For example, the parasite Entamoeba histolytica, which causes amoebic dysentery in humans, does not have the golgi apparatus, the organelle responsible for modifying and transporting proteins. Instead, according to a 2005 article published in The Journal of Biological Chemistry, Entamoeba histolytica contain golgi-like compartments or vesicles that execute similar functions. Sutherland Maciver, a reader in the department of biomedical sciences at the University of Edinburgh noted that there are amoebae, which do not have mitochondria (the organelle responsible for generating cellular energy) because they live in environments lacking in oxygen, or "anoxic conditions. " According to a 2014 review published in the journal Biochemie, such organisms can contain organelles like hydrogenosomes or mitosomes, which are related to mitochondria and are thought to be highly altered versions of the same. This is the case for Entamoeba histolytica and a free-living amoeba, Mastigamoeba balamuthi. Structurally, amoebae closely resemble the cells of higher organisms. "They are like our cells, and in fact when they are moving they look very much like our white blood cells, " Maciver told LiveScience. Like our white blood cells, amoebae move using pseudopodia (which translates to "false feet "). These short-lived outward projections of the cytoplasm help amoebae to grip a surface and propel themselves forward. According to Maciver, as the pseudopodium moves out along a surface in one direction, the back end of the amoeba contracts. "As it contracts, it does two things, " he said. "The contraction pushes the cytoplasm forward to fill the expanding pseudopod, but the contraction also pulls up adhesions at the back end of the cell. " Maciver describes these adhesions between an amoeba and the surface on which it moves, as physical molecular adhesions, which are constantly formed at the front end and broken at the back. This movement — using pseudopodia — unites various amoebae and distinguishes them from other protists (simple eukaryotic organisms like amoebae that are not plants, animals or fungi). There are different types of pseudopodia seen among amoebae, which are distinguished by their appearance. According to the Tree of Life web project, lobose pseudopodia are broad, blunt cytoplasmic projections, while filose pseudopodia (or filopodia) are thin thread-like projections. Other pseudopods are supported by structural elements known as microtubules, which are responsible for executing cell movements. Reticulopodia are thin filament-like projections that mesh together and actinopoda (or axopodia) are rigid, made of a core of microtubules surrounded by cytoplasm. Amoebae can also use pseudopodia to feed. A 1995 article published in the journal Applied and Environmental Microbiology gives the example of a soil-dwelling amoeba, Acanthamoeba castellanii, which ingests both solids and liquids by using its pseudopodia. The process of ingesting solid material is called phagocytosis. "Most of the known amoebae eat bacteria, " Maciver said. He explained that amoebae have receptors on their cell surface that bind to bacteria, which are gathered and taken into the amoeba by phagocytosis, usually at the rear of the cell. In the case of the giant amoeba (for example, Amoeba proteus), the process of phagocytosis is slightly different, according to Maciver. Giant amoebae engulf their prey "by the willful gathering of pseudopods around the bacteria ". In both cases, as the bacteria is drawn in, the cell membrane that surrounds it, pinches off to form an intra-cellular compartment called the vacuole. The process of engulfing drops of liquid is known as pinocytosis. For centuries, the various systems of classifying organisms, including amoebae, were based on similarities in observable characteristics and morphology. "There isn't actually a coherent group of organisms called the amoebae, " Maciver said. "Rather, amoebae are any protozoan cells that move by crawling. " Historically, amoebae were classified together in a single taxonomic group called Sarcodina, united by their use of pseudopodia. Within Sarcodina amoebae were subdivided based on the type of pseudopodia, according to a 2008 article published in the journal Protistology. However, this system of classification was not illustrative of the evolutionary relationships between the amoebae. It was not a family tree so to speak. Molecular phylogenetics changed the course of taxonomic classification for eukaryotes especially. By comparing the similarities and differences in particular DNA sequences within organisms, scientists were able discern how closely they were related. Early analyses compared the DNA sequences that encode the 18S subunit of ribosomes, or "SSU rDNA " (ribosomes serve as the site for protein synthesis). 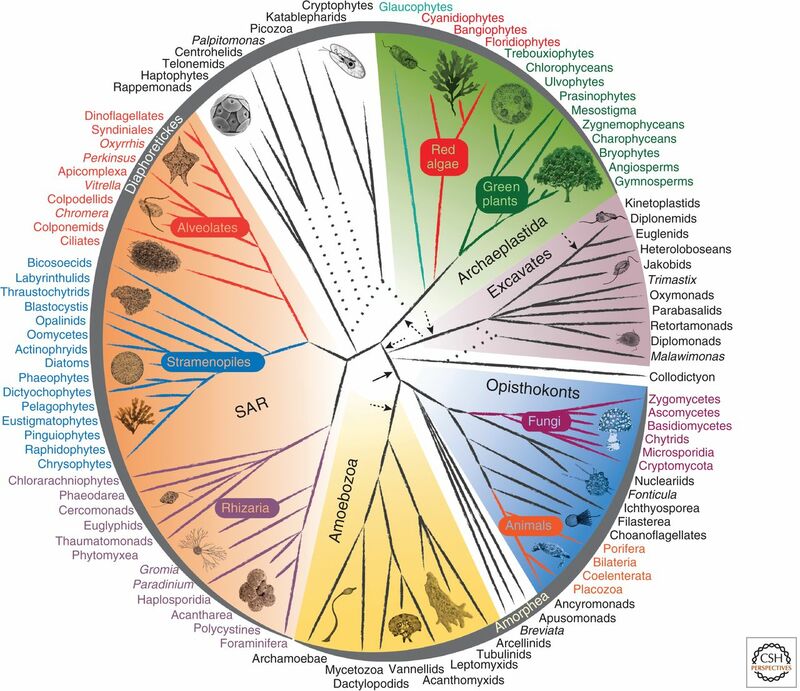 Based on the analyses of SSU rDNA and other DNA sequences, eukaryotic organisms are now organized in a manner that better represents their evolutionary relationships — the phylogenetic tree, according to the 2008 Protistology article. Each lineage in a phylogenetic tree is depicted by a branched structure. In this system, the first levels are known as "supergroups. " Fabien Burki, the author of a 2014 review article published in the journal Cold Spring Harbor Perspectives in Biology, describes these supergroups as the "building blocks " of the tree. Burki lists five supergroups for eukaryotic organisms: Ophiskontha, Amoebozoa, Excavata, Archaeplastida and SAR (which is comprised of three groups, Stramenopiles, Alveolata and Rhizaria). Animals and fungi fall under Ophiskontha. Amoeboid protists and some parasitic lineages that lack mitochondria are a part of Amoebozoa. Together, the two supergroups, Ophiskontha and Amoebozoa form a larger supergroup called Amorphea. Heterotrophic protists — organisms that take in nutrients from other organisms — are a part of Excavata, while plants and most other photosynthetic organisms are a part of Archaeplastida. "If you look at the great diversity of the protists, you can see that there are amoebae in virtually all the groups, " Maciver said. "There's even an amoeboid organism within the brown algae [Labyrinthula]. " According to Maciver, most amoebae are present within Amoebozoa. In addition, he noted that amoebae are also present within Rhizaria, Excavata, Opisthokonta (for example, Nucleariids, which have filopodia) and within the Stramenopiles (for example, the Labyrinthulids). Entamoeba histolytica is a human intestinal parasite. It can cause colitis, severe diarrhea and dysentery. Amoebae have been known to cause a range of human diseases. Amebiasis (or amoebic dysentery)is an infection caused by Entamoeba histolytica, a human intestinal parasite. According to National Institutes of Health, Entamoeba histolyticac an invade the colon wall and cause colitis, or can cause severe diarrhea and dysentery. Though the disease can occur anywhere in the world, it is most predominant in tropical regions that have substandard sanitation and crowded conditions. Contact lens wearers are potentially at risk for a rare infection of the cornea called Acanthamoeba keratitis. According to the Centers for Disease Control and Prevention (CDC), the Acanthamoeba species are free-living and are commonly found in the soil, air and water. Poor contact lens hygiene practices such as improper storage, handling and disinfection, or swimming with lenses are some of the risk factors for the disease. While the initial symptoms include redness, itchiness and blurred vision, if untreated, the infection will eventually lead to severe pain and can lead to the loss of vision. Amoebae also cause different infections of the brain. Naegleria fowleri, which has been dubbed "the brain-eating amoeba, " causes primary amoebic meningoencephalitis (PAM). Though the disease is rare, it is almost always fatal. According to the CDC, early symptoms include fever and vomiting, ultimately progressing to more severe symptoms such as hallucinations and coma. Naegleria fowleri is present in warm freshwater bodies such as hot springs, lakes and rivers, or in poorly chlorinated swimming pools and contaminated, hot, tap water. The amoeba enters from the nose and travels to the brain. However, one cannot contract the infection by swallowing water (according to the CDC). Another amoeba, Balamuthia mandrillaris, can cause the brain infection granulomatous amoebic encephalitis (GAE). Balamuthia infections are rare but are most often fatal. The CDC states the death rate from infection to be 89 percent. Early symptoms include headaches, nausea and low grade fever, which ultimately progress to weight loss, partial paralysis and speech difficulties. Balamuthia mandrillaris is found in the soil and can enter the body through open wounds, or by breathing in contaminated dust. Amoebae can also play host to bacteria that are pathogenic to humans and aid in spreading such bacteria. Bacterial pathogens such as Legionellacan resist digestion when consumed by amoebae. Instead, they are released intact from vacuoles into an amoeba's cytoplasm where they proliferate. In such cases, bacteria can become resistant to treatments designed to control their numbers (for example, chlorine treatment of water). This may then increase the chances of human exposure to bacterial pathogens, according to a 1995 article in the journal Applied and Environmental Microbiology. Maciver cites the example of cooling towers, where both amoebae and bacteria can grow. These cooling towers tend to expel water droplets, which passersby can breathe in. "What's known to happen on many occasions, is that we breathe in a droplet of water containing an amoeba that is full of these pathogens [Legionella], " he said. If bacteria enter the body of an immunocompromised individual in such a manner, they can ultimately infect macrophages, one of the immune system's many defensive cells. "A macrophage not only looks like an amoeba, its biochemical pathways and cell biology are quite similar, " Maciver said. "So the same programmed events that allow the bacteria to escape the amoeba now operate to allow Legionella to escape the macrophage. " Lastly, amoebae are an important part of the soil ecosystem. They regulate bacterial populations. It is possible that more than 60 percent of the decreases in bacterial numbers in the field are due to naked amoebae, that is amoebae without a shell (Applied and Environmental Microbiology, 1995). Amoebae are also important for recycling nutrients in the soil.According to Maciver, when nutrients become available they are taken up by bacteria, that "effectively lock up all the nutrients in bacterial mass. " When bacteria are consumed, nutrients are released back into the soil. "If you have a cycle whereby amoeba eat bacteria, the overall effect is to increase nutrient availability for plants, " Maciver said. Dr. Sutherland Maciver’s website consisting of a vast database of amoebae, facts and research.